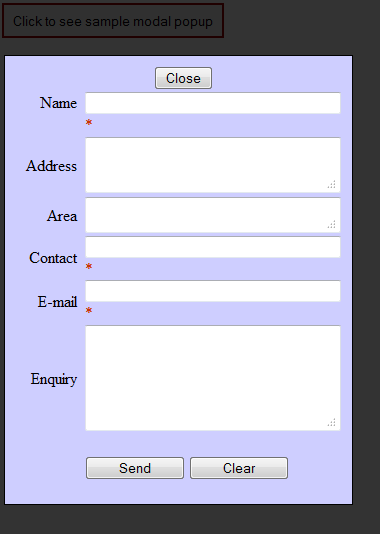 Dear viewers I will show how to use Modal Popup using ASP.Net AJAX Control Toolkit ModalPopupExtender Control. By using this control a pop window is displayed to show detail content of panel or div. In this case I have used a panel for displaying panel content. I have registered the AJAX Control Toolkit Library by putting @PageDirective of AJAX Control Toolkit. Then I have taken ModalPopupExtender Control .After taking panel a close button and feedback table has been taken inside the panel. TargetControlID – This property is used for which control will be activated to fire after clicking. PopupControlID – This property is used for applying which control will be displayed as a model popup. CancelControlID This property is used for applying which control will be used for closing the model popup. BackgroundCssClass - This property is used for applying display ModalPopupExtender background Style. <asp:TextBox ID="txtAddress" runat="server" CssClass="box17" Height="50px" TextMode="MultiLine"
<asp:TextBox ID="txtArea" runat="server" CssClass="box17" Width="250px" Height="30px"
<asp:TextBox ID="txtEnquiry" runat="server" Height="100px" TextMode="MultiLine" Width="250px"